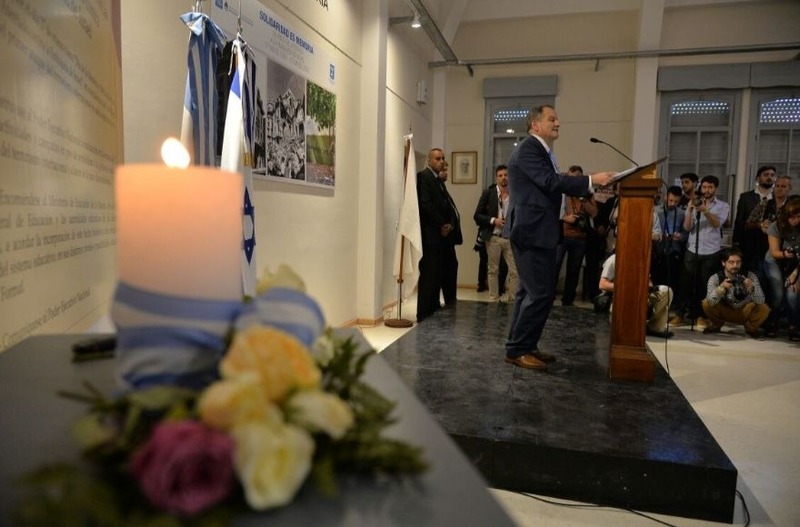 BUENOS AIRES, Argentina (JTA) — For the first time, the ceremony to commemorate the 1992 terrorist attack on Israel’s embassy in Buenos Aires was co-sponsored by the Argentine government. Friday’s ceremony also was held for the first time at the country’s human rights center rather than the site of the bombing. “Today we have decided to remember here, as a symbol, that this is a top priority issue in the government’s human rights agenda,” said Vice President Gabriela Michetti, the main speaker at the event at the National Archive of Memory, where the office of the Secretary of Human Rights is located. The bombing that destroyed the embassy on March 17, 1992, killed 29 and injured 242. It was the first international terrorist attack on Argentina soil. The building that hosted the ceremony served as the Mechanics School of the Navy, or ESMA, and was used by the last Argentine military dictatorship (1976-1983) as one of the main secret detention centers for torture and extermination of political activists who struggled against the regime. It remains open as a museum commemorating those crimes and others against human rights. Survivors of the attack and relatives of the victims were among those on hand for the ceremony, along with representatives of the Israeli Embassy. Israel’s ambassador to Argentina, Ilán Sztulman, said the tribute was a clear expression that the attack “was a fact that has affected the entire Argentine society. This site shows that universality. “Twenty-six years after this tragic date, the citizens of the world are moved again because the perpetrators did not pay for the crime. The Republic of Iran, through Hezbollah, continues to expand terror globally. As we said here 26 years ago, terrorism will not defeat us,” Sztulman said. A photo exhibit about the attack was inaugurated Friday and will remain on display for two weeks. Some of the photographs in “Solidarity is Memory” will be incorporated into the permanent exhibit at the human rights memory center. Argentina has accused Iran of perpetrating the attack and also of the 1994 bombing of the AMIA Jewish center in Buenos Aires, which killed 85 and injured hundreds. The perpetrators of both crimes have never been caught.